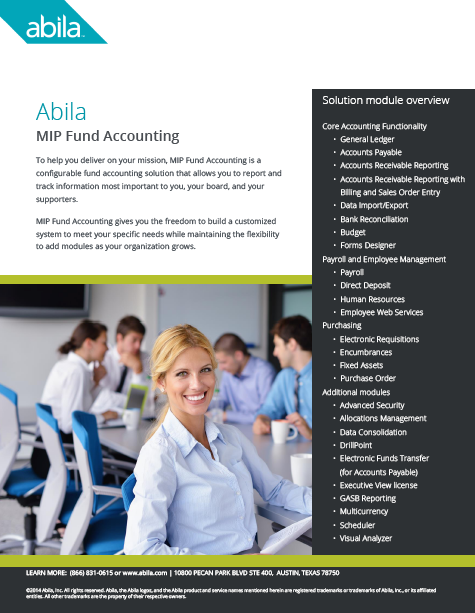 Abila MIP Fund Accounting addresses every obstacle a non-profit organization will face on a daily basis. Regardless of your non-profit sector, MIP Fund Accounting’s modular approach and NP Solutions’ experience allow us to structure an appropriate system. Contact us and let’s decide together which modules deliver the proper functionality for your organization. Download the MIP Fund Accounting Overview Brochure for a list of modules and features for accounting, reporting, budgeting, purchasing, allocations management, and much more. MIP Fund Accounting Video: See How It Works! Want to see how MIP Fund Accounting would work for YOUR organization? Just leave you name below and we’ll follow up to schedule a personal demonstration and show you how the system would work with your workflow, accounting requirements, and organizational needs.